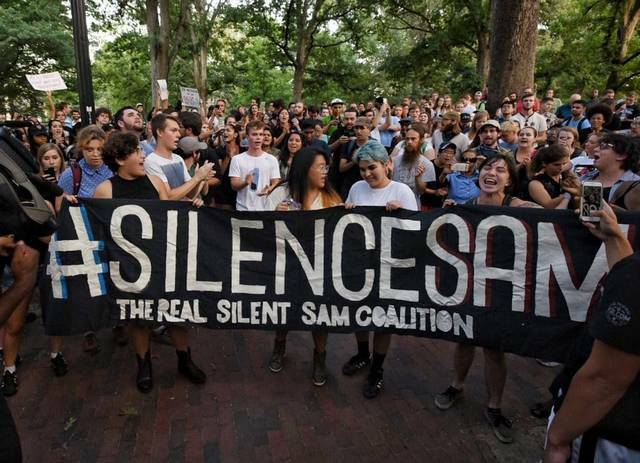 In Chapel Hill, NC, a statue known as Silent Sam sits on the campus of the University of North Carolina. Activists want it removed and people are holding vigil there until it is gone. Twice this morning, I felt compelled to answer memes about how people who are triggered by events or even physical things in their paths should just quit whining. One of the memes had a white woman crying with a caption about how we should feel sorry for her because of the statues. My reply was that she was white, so it was highly unlikely it was from statues of people who owned and hideously abused her ancestors. Science has found the trauma from that is still encoded into the DNA of the descendants of slaves. Most of these monuments were erected either during the Jim Crow or Civil Rights eras. They were put there to remind people that even though the Confederacy was gone, its rules still applied to black people and that those rules would be enforced — with force. They were meant to instill fear in people of color. That was their purpose. Get it? The woman in the meme — and the person who posted it — didn’t lose a great-uncle to lynching in the 1940s or ’50s. Her mother never suffered the indignity of being sprayed with a high-pressure fire hose to “cleanse” the streets of her and her friends. She never had to attend a school named for the oppressors of her ancestors or listen to her parents talk about being beaten and jailed for trying to register to vote. She never had to go to a segregated school where everything — from the building itself to the books and equipment — is inferior. And although this was addressed with desegregation in the 1960s, schools are very nearly as segregated now as they were in the Jim Crow era. People of color are 16 times more likely to be shot and killed during a routine traffic stop. The corporate-run prisons use fourth-grade reading test scores of students in these segregated schools to determine their future prison populations. The other meme was about how people can choose how to respond to triggers by choosing to be OK. I can’t choose to be OK when some trigger takes me back to the moment of my son’s death or to being molested as a child. That’s why these things are called triggers. When you pull the trigger to a loaded gun, it goes off. Those traumas are the bullets. Get it? You’ve never been followed by security guards when you walk into a store because you’re black so you must be a criminal. You have no right to tell a person of color the cop isn’t going to hurt him after you’ve seen on video the murders of innocent people who look like you and then seen the victim vilified in the media because he might have been jaywalking or the cop thinks he might have smelled pot, and then watched the murderer walk free, even with video evidence against him or her. In the NFL, murderers, abusers and other criminals get to play again, but a single man who knelt rather than stood for the anthem of the nation that still oppresses people who look like him is blackballed. It is time for these monuments to be removed from the public square and placed in context in museums and cemeteries. We need to start thinking about how to replace the monuments to hate with monuments to the courageous people who fought — and continue to fight — racism and oppression. We need to build monuments to the people who were bought and sold and endured hideous torture before perishing as the property of others. We need to build monuments to the abolitionists. We need to build bridges of understanding so more of us understand the trauma others endure, even if that trauma doesn’t affect us. That’s called compassion and empathy. We should try that for a change.